In our neck of the woods it's the CRCT. I've taught in systems where it was the ITBS. When I taught in the state of Texas it was the TAAS. Whatever the letters you give them, standardized tests cause children to dread going to school for a week (sometimes longer) because they know the drudgery and boredom that awaits them. I am well aware of the "NEED" for standardized tests. And that need doesn't have anything to do with children and what is best for them. I have a Masters Degree in Educational Leadership and Supervision. I spent two years of my life learning how to perpetuate the mass education and standardization of our nation's children - to turn them all into dutiful workers for the state. Before that I spent 10 years administering tests as a teacher in the public schools. I could spout off dozens of "whys" for standardized testing - and sound quite convincing. I will be giving standardized tests this month in our homeschool. I don't want to, but I have to (per the state of Georgia), and I know they need to be familiar with the reality of testing in our society. No matter why they take the tests, children can't be STANDARDIZED, and neither can their learning. If you really KNOW a child, you know they are so much more than a test. They are heart, soul, creativity, feelings, and a host of other things. How can you measure subjective qualities like that? Judging children by a test totally discounts their personalities and God given abilities. When I was teaching I had a child ask me a question during the ITBS. This child was supposed to answer a series of questions based upon a picture. That picture was of a telephone booth. This was the year 2000. Phone booths were nearly obsolete, and in our suburban area this child had never seen one and didn't know what it was. That child missed every question in that section. Their self esteem suffered because of a dumb test. I remember feeling so powerless. The system is so broken it's just overwhelming to even think about fixing it - so we'll just keep doing what we are doing. That sounds like a plan. I know so many wonderful teachers that were required to "teach to the test". They knew it was wrong, but they had to follow the rules of their administration. I worked in one school where we had to place our learning objectives on a bulletin board in the hall... specific objectives in state mandated language. When people from the central office came by they were supposed to see evidence of "instruction to match testing goals." Those poor teachers. Talk about stifling creativity. People will go to great lengths to ensure their school performs well on "the test". Just consider what went on right here in Atlanta a few years ago. How sad. You just don't cheat children. I didn't really think very deeply about standardized tests until my daughter was affected by them. She always tested well. So well, in fact, that her second grade teacher recommended (after good test scores and personal observation) that she be "tested" for the talented and gifted program at her school (called REACH). As a parent, I was very proud. She took the tests. We waited for the results. Rather than receiving a call, or even an email, my daughter got off the bus one day with an envelope. The gifted teacher had given it to her that day at school and had told her not to open it. It was for mom and dad to open. She excitedly gave it to me, anticipating the results inside. Looking back, I should have waited and opened it privately. Instead, however, we opened it together in the driveway. "Your child, Anna, did NOT qualify for the REACH program." From that instant I had a very disappointed little girl in my house. Nothing we could tell her would make her feel better about herself. I didn't care one bit about her not getting into the gifted program. I cared about my precious girl's heart that had been crushed - her self esteem trampled on. I expressed my dissatisfaction with the teacher and the principal. I kept thinking in the back of my mind how she would be pigeon holed into a track of classes in middle school - not eligible for "honors classes" because she wasn't on that gifted track. I felt sick to my stomach. How could "THEY" know -- that my daughter - at the age of 8 - could be confined to a lower track than other children? This was one of the final nails in our public school coffin. The final nail came when in the beginning of third grade, at the first parent-teacher conference, her teacher told me what a lovely girl Anna was. She said (and I quote) "I don't see her as "gifted" but she certainly loves to please and this will take her far." I wanted to mention how this "desire to please" and "love of learning" might just ensure her success more than someone who was naturally "gifted". Her drive and determination might actually serve her better in life. I knew then and there I couldn't leave my child in this environment for much longer. Oh, I know many children that did just fine there, but I wasn't willing to leave my child's future in the hands of a system that clearly didn't have her best interest at heart. And I think, if many parents really ask themselves what is best for their own child, they would agree with me. But I also think that many parents are just too uninformed, hesitant, or afraid of homeschooling to give it a try. My daughter left that school just one month later... and the rest is history. My children's education now is SO FAR from what I was perpetuating 15 years ago. I am so thankful for the right to homeschool. I am thankful to let my children be who God created them to be. I am thankful they will not be judged by their ability to "bubble in". I am thankful for the courage we had to pull our kids out of a system that so obviously segregates, subdues, and shuts down our children. In recent months I've thought a lot about how fortunate we are to homeschool, and how that decision has changed my family's life in so many ways. I'm curious - do you have to give your children standardized tests in your state? What are the requirements? 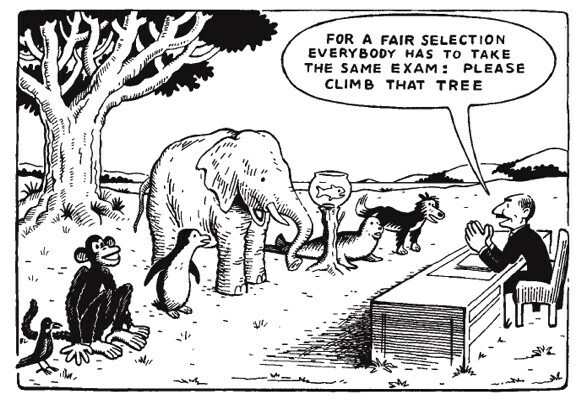 What are YOUR thoughts on standardized tests?